SPL leaves only a single small scar. incisional pain associated with the multiple points of entry used during traditional laparoscopic surgery. or articulating. Standard hand instruments are rigid in design and were developed over the last 30 years for use in laparoscopy. own surgical skills and cost as articulating instruments are significantly more expensive than standard instruments. target tissue from a single access point. in the United States and Europe have used standard instrumentation. bleeding, infection, incisional hernia, intestinal adhesions and scarring. successfully performed in the United States, from general surgery to urologic, gynecologic and bariatric surgery applications. comparison with natural-orifice transluminal endoscopic surgery". BJU Int 101 (12): 1493–6. DOI:10.1111/j.1464-410X.2008.07586. ^ "UCSF Surgeons Perform First Single-Incision Gallbladder Removal". Emax Health. 2009-06-06. Retrieved 2011-07-23. ^ "Hartford Business". Retrieved 2011-07-23. Endoscopy 23 (4): 896–9. DOI:10.1007/s00464-008-0147-y. PMID 18815836. ^ Saber AA, Elgamal MH, Itawi EA, Rao AJ (2008). 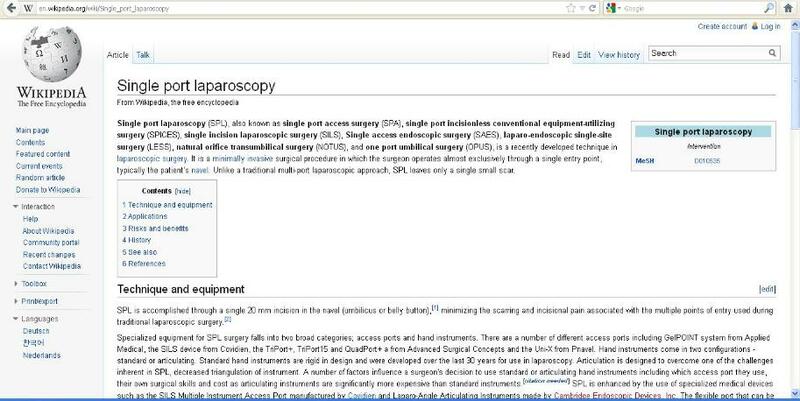 "Single incision laparoscopic sleeve gastrectomy (SILS): a novel technique". Obesity Surgery 18 (10): 1338–42. DOI:10.1007/s11695-008-9646-0. PMID 18688685. (TM) HD Instruments". Retrieved 2011-07-23. ^ "News and Announcements". Retrieved 2011-07-23. ^ "Surgery". Agency for Healthcare Research and Quality. 2009. Retrieved 2011-07-23. ^ Esposito C (1998). "One-trocar appendectomy in pediatric surgery". Surg Endosc 12 (2): 177–8. PMID 9479738. ^ story/154201348.html?start:intl=0 "Region's First Belly-Button Hysterectomy Performed". The News Courier. 2009-06-05.